Let's start out with one of the stars of the last movie, Will Ferrell. The original reports for The LEGO Movie 2 made it look like Will Ferrell would not be returning in this animated sequel, along with Liam Neeson and Morgan Freeman. While Neeson and Freeman did end up ducking out for the sequel, Ferrell did lend his voice to this movie, but only for brief moments. His character President Business abandoned our heroes at the beginning of the movie to go golfing, and didn't return until the last few minutes. He also returned for his role as the Dad in the human world, but only lent his voice, seemingly unable to be on set for the live action production. All of his voice roles were incredibly brief, making his appearances feel more like cameos than an actual role in the movie. In order to keep a parental figure in the human world of The LEGO Movie 2, Warner Bros. cast Maya Rudolph as the mother of Finn and his sister. Rudolph's introduction was quite the shocking reveal, as she had not been marketed to show up in the movie. Much like Will Ferrell in the original LEGO Movie, Maya Rudolph appeared during the third act of this LEGO movie, initiating the climax of the plot. It was certainly a fun appearance, and Rudolph added a bit of comedy to the role. Following their appearances in The LEGO Movie and The LEGO Batman Movie, Channing Tatum and Jonah Hill reprised their roles of Superman and Green Lantern in The LEGO Movie 2. The two actors landed these bit roles in this animated franchise after working with the original movie's directors Christopher Miller and Phil Lord on 21 Jump Street, and they've added quite a bit of humor to the franchise ever since. This LEGO sequel continues the conflict that Superman and Green Lantern have been having in the movies, and even adds a clever twist. Richard Ayoade, one of the stars of The IT Crowd, also had a small role in The LEGO Movie 2, voicing Queen Watevra Wa'Nabi's butler, Ice Cream Cone. Though Ice Cream Cone only had a few lines in the movie, the tired and sarcastic attitude of Ayoade made his brief appearances absolutely hilarious. Last year's Aquaman was a huge box office hit, earning well over $1 billion at the box office to become the highest grossing DC movie of all time. Since both movies are made by Warner Bros., the studio requested the Aquaman star to reprise his role in The LEGO Movie 2, which Momoa was seemingly on board for, providing his surfer-like attitude to the already large voice cast of the movie, even throwing in a few "yee-haw"s while he was in the recording studio. The most humorous part of this cameo, however, is that the LEGO Movie already introduced an Aquaman to the franchise, specifically the blonde version from the comics. In The LEGO Movie 2, Momoa's Aquaman is now a completely different character from the blonde Aquaman, with the Justice League choosing Momoa in their adventures over the classic version over the character, who is left behind with the rest of the Master Builders. Though it took three movies, Superman's greatest nemesis Lex Luthor has entered the LEGO Movie franchise. Luthor is voiced by Ike Barinholtz, a comedy actor who is probably best known for his roles in The Mindy Project, Neighbors and Blockers. This is actually the second time Barinholtz has played a DC character, as he also appeared in Suicide Squad as Griggs. Reprising his supporting role from The LEGO Batman Movie, Academy Award nominated actor Ralph Fiennes returns in The LEGO Movie 2 briefly as Alfred Pennyworth, Batman's butler and most trusted ally. Alfred is one of two characters introduced in The LEGO Batman Movie to appear in The LEGO Movie 2, with the other being Harley Quinn. However, unlike Harley Quinn, Alfred's voice actor from The LEGO Batman Movie actually stuck around for The LEGO Movie 2. Another returning actor, Will Forte is back as Abraham Lincoln. Forte briefly voiced this former President in the first LEGO Movie, but Lincoln quickly abandoned the rest of the characters in that movie out of distrust in Emmett, not appearing again for the rest of the movie. The LEGO Movie 2's version of Abraham Lincoln is quite a bit different, matching with the gritty, post-apocalyptic tone of the rest of the characters at the beginning of the movie. Jimmy O. Yang is a comedy actor best known for Crazy Rich Asians and starring in Silicon Valley. Yang appears in The LEGO Movie 2 as one of Queen Watevra Wa'Nabi's followers named Enthusiastic Zebra. As his name suggests, he is one of the most enthusiastic characters in the movie, particularly during the song "The Song That Will Get Stuck In Your Head." The first LEGO Movie featured a team of basketball-playing Master Builders led by Shaquille O'Neal, so it only makes sense that The LEGO Movie 2 would follow suit. 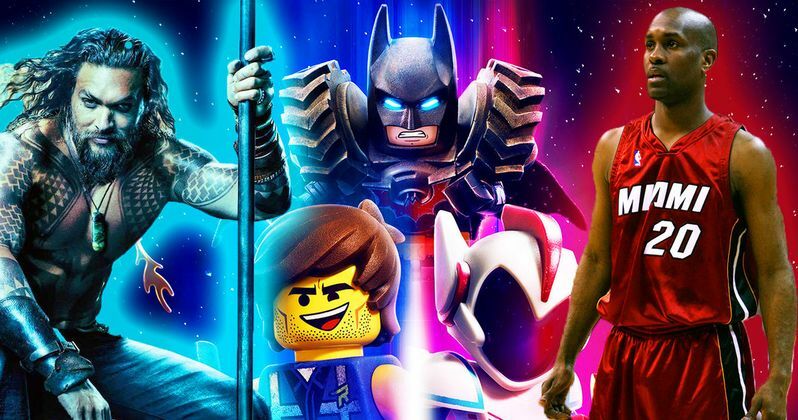 LEGO versions of the legendary basketball players Gary Payton and Sheryl Swoopes show up in the beginning of The LEGO Movie 2, voiced by themselves, living among the rest of the Master Builders in the new post-apocalyptic LEGO world. The Gary Payton cameo is actually a callback to when LEGO designed a LEGO version of Payton back in 2003. Director Christopher Miller is not a stranger to publicity. Alongside Phil Lord, he is known for directing 21 Jump Street and The LEGO Movie, but his greatest public outing was probably when he and Lord were fired from Solo: A Star Wars Story several months into production. Though he didn't direct The LEGO Movie 2, he did write and produce the movie, and even lent his voice to a few characters. In the first LEGO Movie, Miller voiced TV Presenter, a character who was actually based off of himself. In the sequel, Miller voices a number of new characters with only a couple lines, such as a horse, the chocolate bar, and Chad.